I look around and I see M4s. On players, I see M4s. On ASGI, I see M4s. On Evike, I see M4s. On this site, I see M4s.... Sooooooooo many M4s. Why? The first answer I usually get is the ability to customize them. Customize everything. Gas blocks, pistol grips, foregrips, forearms, RIS units, peq boxes, stocks, scopes, sights, barrels, flash hiders, suppressors, sling lugs, cup holders, seat warmers, passenger side airbags... EVERYTHING. On paper it sounds ligit. 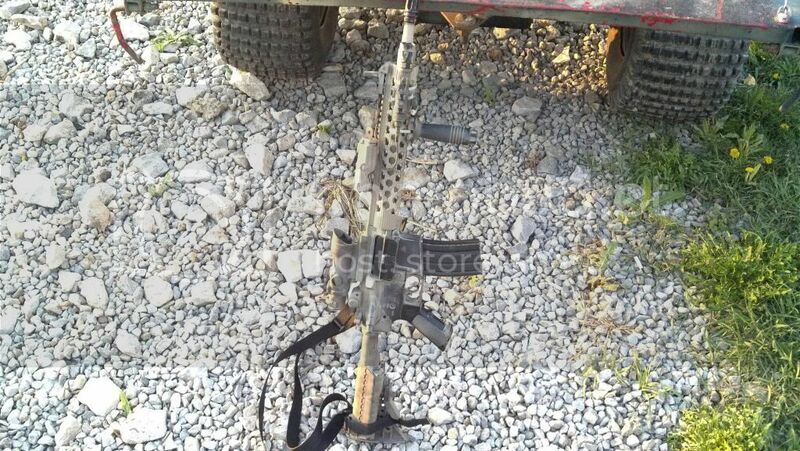 Random Airsoft Player #53927 wants a gun that stands out, looks like a one of a kind machine. Sadly this is no longer the case. In the quest for a unique gun it seems 90% of airsofters have doubled the weight of their "M4" by adding a commercial stock, commercial CCO of some sort, commercial RIS, commercial grip, a new mean "agressive" looking flash hider, a useless shoot-me light, a foregrip, and maybe some useless flip up sights. The problem is I just described 90% of you. Not very unique now is it. It really doesn't matter what brand, color, or how many cup holders. They all blur together. When every Spec Ops wannabe douche carries one with his skate board helmet covered in velcro an IR reflectors (presumably so the short bus doesnt run you over?) and fake beacons and cameras it all looks the same. You all look like COD ninja kids. In my 3 years of service I have not once seen a gun or a person look like that. But I digress, this is about the guns, the gear will have to wait for another blog. Now on to the next issue.... these things drive the market now. Every year I see the "new products" exponentially fill up with stuff that isnt that new to me. You dont even have to build this things anymore. Now all you have to do is troll your way through the terrible interface on ASGI until you find the douchiest M4 possible... with just enough magpul or daniel defense to make you the most unique m***** f***** shooting plastic at kids in some old guys back yard. All the diversity it seems has moved over for the tacticool garbage. I miss seeing rare and different guns at games, The AUGs, L85s, the FAMAS... now all gone. Out of production and out of stock to make room for the "unique". Even the "different" guns still look the same now. I see a growing percentage of AKs with commercial m4 crap and RIS on them. The Masada? from across the field that looks like an M4, sorry, go back to COD. The XCR? sorry dude, that IS an M4. Nothing grabs my interest anymore... and it makes me sad. I know none of you like to admit it but this sport is half fashion show, and sorry, but that guy with the properly set up Alice rig will turn my head faster than the tacticool clown will. To you guys, I issue a challenge: Build something unique. I dont meant conveniently bolt 20 pounds of crap onto your rails. Dont let modularity do the work for you. Make something that will impress even me. Turn some heads for once. Most importanly, distract all those 12 year olds from wanting to touch my 240, or as they call it, my "sweet saw". I think you've allowed yourself to focus more on the materialistic nature of the hobby than the true existentialism. Airsoft is the embodiment of self-indulgence. Mental masturbation. The diversity comes not from the gun or gear, but fromt he person in the camo. Look closer at the man behind the trigger and less at fact he has a Guarder steel trigger inside a G&P body. The true spirit of airsoft is the camraderie in the hobby, not the fashion patrol that chastises you for putting a Ranger Green pouch on your OD drab carrier, next to the sage green GP pouch. If you let the High School Girl mentality interfere with your ability to enjoy the rich diversity in the game, you're missing the forest for the trees. This is why I've never owned an M4. Why M4 and AK? because they are the only true platform where you can find parts from the shims to the nuts. Every other platforms and to an extend brands, don't offer parts. So while the L85 or the Famas or the P90 are unique guns, when your gun take a dump and you need to replace parts, you are screwed. So yes, unique would be great but if it means buying a new gun every 3 months, that become a very expensive uniqueness. You know, I run with an MP5 myself...but man, I suddenly want an M4 like crazy. I actually have a magpul M4 because I got a great deal and it is really comfortable in my hands, but yes, I hate the fact that everyone else has one too. I actually wanted to buy an AUG or F2000. I will be getting the Magpul PDR and Kriss Vector when they reach the market because I love pdws, but do you know why I and many others don't use the AUG, L85, Famas, f2000 etc? Because there is no high quality company out there there makes a version of these weapons that is worth the money. If KWA made an f2000, I would have one. Guess what, only G&G does, and they consistently under perform for my demands. Why did I buy a Magpul M4 when I originally wanted an AUG? Because I consistently found negative reviews about the external and internal quality of most of these weapons, and even spoke on the phone with a representative from CA who told me not to waste my money buying an AUG. He assured me I would get far better performance and quality out of ANY decent M4, (not just Classic Army's), than I would from the nicest AUG on the market, which he claimed was CAs. I think the success of the G36 has had alot to do with KWA's sale of them, and the increase in Echo 1s quality. Without that, I don't believe we would see much of those either. Availability of decent midcap mags is also an issue for these rifles. Oh, it's this discussion again. Everyone has an M4, but no one has my M4. See what I mean? And the whole mall ninja deal doesn't really make sense in the context of M4 ownership, just because a few kids are impressed by the dedication of our armed forces enough to imitate them, and, as we know, imitation is the highest form a flattery. Would also point out, you're looking for "unique" inside a hobby that replicates military. The military is key on uniformity where individuality is set aside to serve the collective good. Yeah forget M4s, that's why I use an M16. Or how about I play with what I'm comfortable with, not what's "unique" and "cool" to your preferences. I like the M4 CQB platform, I'm using the damn M4 CQB platform. I've held and fired the following: AUG, AK-47, MP5, SAW, G36C/K/E, M3 Shotgun, M16, multiple M4 configurations, M4 CQB, SCAR-H, Masada, M14, UMP. You want to know what has been my favorite? The M-frickin-4 CQB. The G36C was close, but there's something I like about the M4 that little bit more that I have a preference over the G36C. However, if I were to buy a second gun, a G36C would definitely be next on my list. A secondary reason, which I believe was already mentioned, was parts availability. Sure, you may have an uber leet FAMAS, but when something in your gun breaks, good luck fixing it. Also, I chose the M4 because I LIKE THE WAY IT FEELS. I don't choose a unique gun because I find M4's to be more comfortable (although like I said, G36C's are Niiicccee). Lastly, if something breaks, I can fix my M4 a lot easier than a G36C (Which I believe was my deciding factor, budget). All in all, you gotta look past the looks and focus on functionality, which if it isn't legit operator enough for you, then so be it. Im pretty sure that there are a total of 4, possibly 5 troy M4's(by Troy Rifle, i mean an m4 with Troy extreme Battlerails) being used in Ohio right now. And of that small number, i am certain that Phil is the only one with a shorty varient. Now, another thing i want to point out is that most people do not get an M4 just to make it unique, but to have a gun that can very easily be customized to their playing style and for comfort. I just googled a Troy M4. I also googled just m4. Already forgotten which one is the Troy. I'd also like to point out that the 3 pictures so clumisly (O I C WHAT YOU DID THERE) dropped in this blog were all G36s. So far we've established that you use an M4 when you want a super sweet smooth "platform" to be a super leetzorz nubkilling operator. You use An AK when you want to be a little different, You use a Bullpup when you want to waste money, and you use a G36 when you want to be unique? This is what I mean when I say Troy M4, the kind with a Troy Exteme Battle Rail, or Troy Viking Tactics Fore end. Maybe you were too busy trying to be unique to really read my post. Sorry. I was too busy lulzing to enter the generic name of a rail system into google. a) I only see two picture of G36s. b) I actually placed my picture with care and precision. Thats just how I roll.